With the election behind us, we can now redirect our attention back to reality. Whether your candidate won or not, November is the month of harvest and gratitude. I have noticed that many people are posting on Facebook things they are “grateful” for each day and it made me stop to think about some of the things for which I am appreciative. 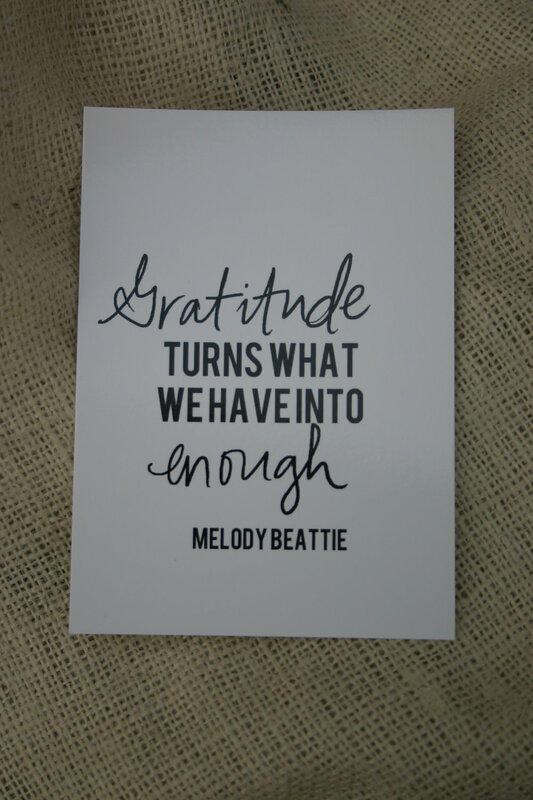 I think this quote by Melody Beattie says it all. Thanksgiving is my favorite holiday and it’s just two weeks away. I have been busy testing pumpkin dessert recipes (the winner remains the pumpkin custard), celebrating the arrival of Cowgirl Granola’s über-popular Thanksgiving blend, walking the dogs so we can enjoy the spectacular weather, planning the Thanksgiving menu with my cousin and focusing on the joys of the season. Since the holiday season–at least in my world–is all about the food, I’ve put together a few edibles that I am in love with right now with the hope that you will also fall in love. In no particular order, here’s the things that are making me smile right now. Real apple cider and crispy, sweet apples–Nothing says fall like the sip of real apple cider or a bite of a crisp apple. I’m a fan of the Fowler apple cider and Honeycrisp apples from Central Market. to make sure you take home the one you love the most! Hot Joy–As a friend suggested, “I am overflowing with Hot Joy.” There’s a new pop-up restaurant in town, but you can’t tell anyone. Promise? Earlier this week, we ventured to Hot Joy which is a sort-of pop-up restaurant at The Monterey. It’s only open on Sunday night and Monday nights when The Monterey is closed. Small plates. Asian fusion. Down-right exquisite food. Every dish was better than the previous. We oohed, ahhed and devoured the best meal we’ve ever had in this town. Truly. You know I don’t give compliments like this so believe me. Chef Quealey Watson, formerly of The Monterey, has returned to town with big ideas on how to “bring it” (his words, not mine) and he has succeeded. You’ll find me at Hot Joy as often as possible. Mean Green–I start my Sunday mornings at the Quarry Farmers & Ranchers Market with a tall bottle of Mean Green from Revolucion Coffee + Juice. This cold-pressed juice is loaded with kale, cucumber, celery, apple, lemon and ginger and gives me everything I need to feel spunky and yet not weigh me down. Angela Carral, the owner, makes a wide variety of juices but the Mean Green is my fave. During the week, you can stop by her store at 7959 Broadway and pick up a bottle. Or two or ten. Use as a meal replacement or a snack. Your body will thank you. Sugar pie pumpkins–This ubiquitous Halloween decoration is more than just something you put at the front door to welcome trick or treaters or place on your dining room table to signal the arrival of fall. Roasted, these beauties become a magical ingredient for fall soups, sides and desserts. Since they first arrived upon the scene at the grocery store, I have roasted three 6-pound orange-fleshed gourds to test recipes and store in the freezer for cold winter days when we need some comforting soup or something sweet. Be sure to also roast the pumpkin seeds for a tasty treat. What foods are you grateful for right now? Let me know. I’m always up for inspiration. Previous Post: « Feeling Nutty?